With any industrial application, it is often desirable to keep track of item weights over time. The simplest example of this is a tank of liquid or liquefied gas that is used for an industrial process. The material may be an adhesive that is dispensed onto a substrate, or it might be a coating or paint that is sprayed on items at some point during the process. Sometimes multiple ingredients are mixed together by being fed into a mixing container. The amounts of ingredients used and left over must be tracked and recorded. In the food industry, a variety of liquids, powders, and other materials are mixed together to make fixed recipes. The best way to determine the amount of material in a tank, carton, pail, or other container is to weigh it on an industrial scale. The scale may be a large floor scale or drum scale. Whatever the case, it depends on how objects are weighed and how accurate the measurements must be. For measuring smaller containers, a platform scale is usually suitable. Lighter loads can typically be measured on a digital bench scale or precision scale. Electronic scales must be designed for specific materials being measured and the environment in which the weighing process takes place. A general-purpose floor scale with a steel platform and stainless steel load cells is ideal for most industrial workplaces. If the environment is corrosive, then a stainless steel platform scale is a better option. 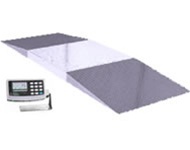 A drum scale with an aluminum platform is usually fine for most weighing applications, but if there are highly reactive ingredients being weighed, then we suggest a stainless steel platform for the scale you purchase. While an industrial process is taking place, the measurements of materials being consumed and produced, or the measurements of material remaining to be processed, must be logged for future analysis. There are sophisticated and expensive systems available to do these kinds of things. For example, the most common method is to run a communication cable from a central computer to each industrial scale in use. A standard communication protocol, like a RS-232, can transfer weight data from scales to computers easily. This method isn’t always suitable for every industrial application though. For example, the computer and scale need to be close together and in the same room. It costs a lot to run cables from industrial equipment too. There are a number of electrical codes that must be followed and wiring may have to be routed through existing ceilings, walls, or other obstructions. One way to reduce the cost is to network a number of scales and have them all connect to one computer. A multi-drop protocol, like RS-485, may be employed to do this. 1 cable is routed from scale to scale and continues on to the central data collection device. An adaptor is used to convert the RS-485 data into a standard that the computer can accept, like a USB. It is not always necessary to monitor the weight in real time. People don’t usually need to know what’s being used at one time all the time. They simply want a logged history of material over a period of time. Arlyn Scales offers a simple and less expensive method for logging data with our line of industrial scales. Our entire line of scales, which includes parts counting scales, floor scales, lab scales, bench scales, drum scales, and floor scales, can include USB memory stick data loggers. Scales can be programmed to send weight data to the memory stick on a timed basis that can vary from 1x every hour or more. The scale operator can push a key on the front panel of the scale every time a frame of data must be recorded. An internal clock system records the time and date of each measurement frame. USB memory sticks are expensive. A 2-gigabyte device can cost as little as $12 and it can record 100s of 1,000s data points and the time associated with each. Data sticks can be removed from the scale and used with any computer. When plugged into a USB port on the computer, the collected data can be entered into an excel spreadsheet or access database file. Standard data analysis tools can be employed to examine the scale data. Arlyn Scales’ industrial scales feature easy-to-read graphics LCD displays, which have full numeric keypads, easy-to-navigate menu driven interfaces, and large memory capacities. Digital indicators offer scale operators unit conversion, net and gross weight measurements, and tare and zero. Unit conversions include: pounds, kilograms, ounces, and grams. Arlyn Scales has found that using 4 stainless steel load cells in our industrial scales has numerous benefits. For example, stainless steel load cells survive shock loading and overloading better than aluminum or steel-plated load cells. And stainless steel load cells are able to resist damage from moisture. Drum scales manufactured by Arlyn Scales can handle the occasional spill of hazardous or non-hazardous liquids. And they can endure the weight of heavy drums and accidental hits by drum carts or forklifts. Scales manufactured by Arlyn Scales are also able to re-calibrate themselves, which ensures highly accurate results always. Weighing liquids can be a laborious task, but it doesn’t have to be. Arlyn Scales supplies high quality and long lasting drum scales and floor scales that are capable of delivering accurate weight readings. And the best part is: Arlyn Scales offers top-quality industrial floor and drum scales at factory-direct pricing. Shop floor and drum scales with Arlyn Scales today by visiting our website. Contact Arlyn Scales with any questions by calling 800-645-4301 or fill out our online contact form. Learn more about all of the scales Arlyn Scales designs and manufactures on our website.